This is my “six hours on the bike delirium” face. No, my face did not stick this way. This 53 year old child had the time of his life yesterday.. until the next time of my life, probably tomorrow morning, when I can ride my precious mountain bike again. My friend, Jon, has become a serious enabler for me this time of year, prodding me to go above and beyond on the bike. Getting on a bike at any time of the year is no problem for me, but Jon does not go out for short or slow rides. 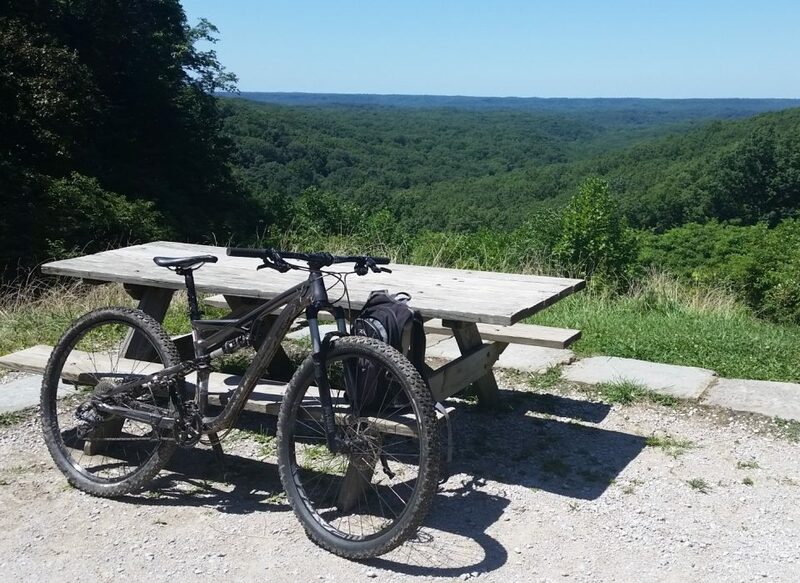 So yesterday we went to the Kettle Moraine region in southern Wisconsin to ride the John Muir and Emma Carlin single track trails. 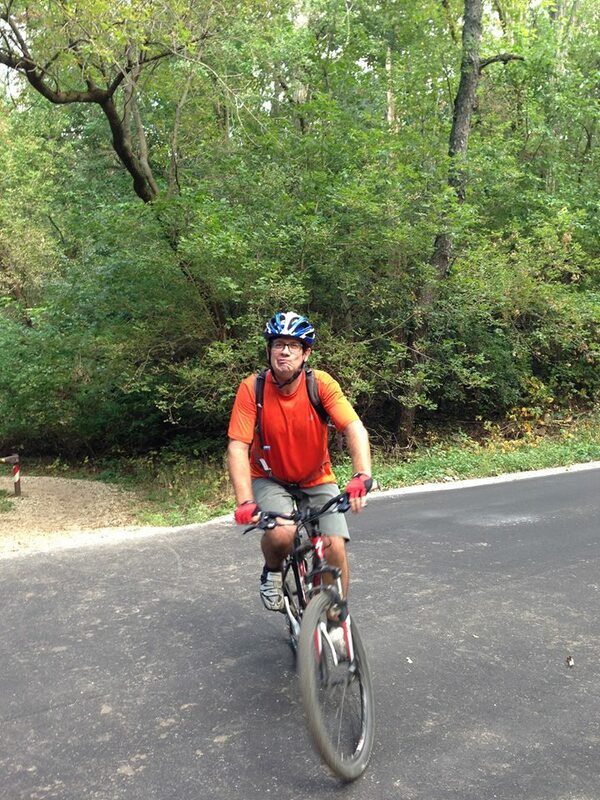 We took a relative mountain biking newbie with us, a friend I have been riding with for close to twenty years, Frank. Frank is one of those guys with next to zero body fat and such a tolerance to pain that I sometimes wonder how he can survive — I have seen him get up from a crash more than once to finish a ride with broken bones and ride a punishing pace for hours when he was not in top riding shape. In essence, I went riding with two guys who I knew would make sure I got the most out of my ride. 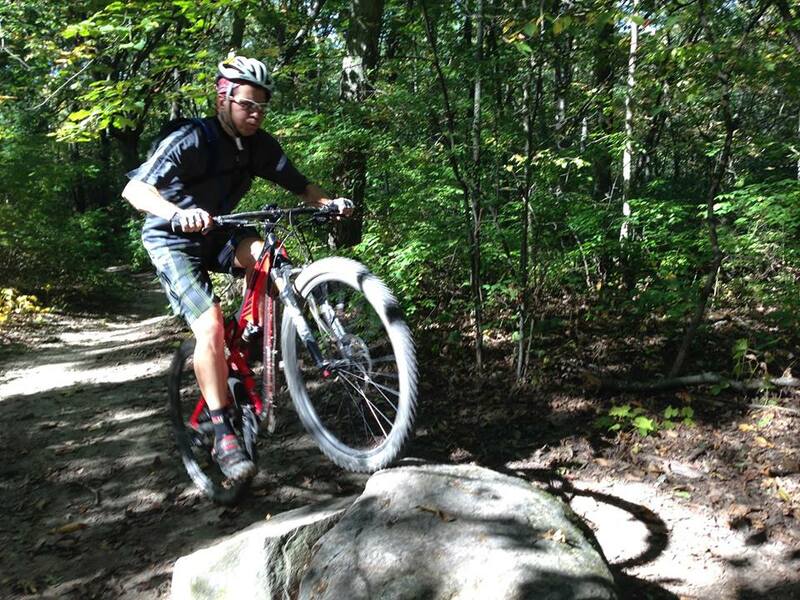 We rode for more than six hours, fast and on some fairly challenging trails. We rode off the trails and down the road for a short lunch at a bicycle shop deli close to the trail head, then went right back to the trails for more. The trails twisted and turned with lots of climbing, covered us with grit as we rode the sand and dirt. Rocks and log obstacles greeted us all day. I rocketed around corners and jumped rocks like I was a kid again… so much that I started to realize that I am not that kid any more. Funny how that happens. And then friends who challenge you, like my friends Jon and Frank, remind me that there is always that energy reserve I forget existed. Five hours into it, they both reminded me that there was still plenty of daylight left and we came there to ride. So we did. We even made new friends. I came zipping around the corner to find a hog nosed snake sunning himself across the trail. 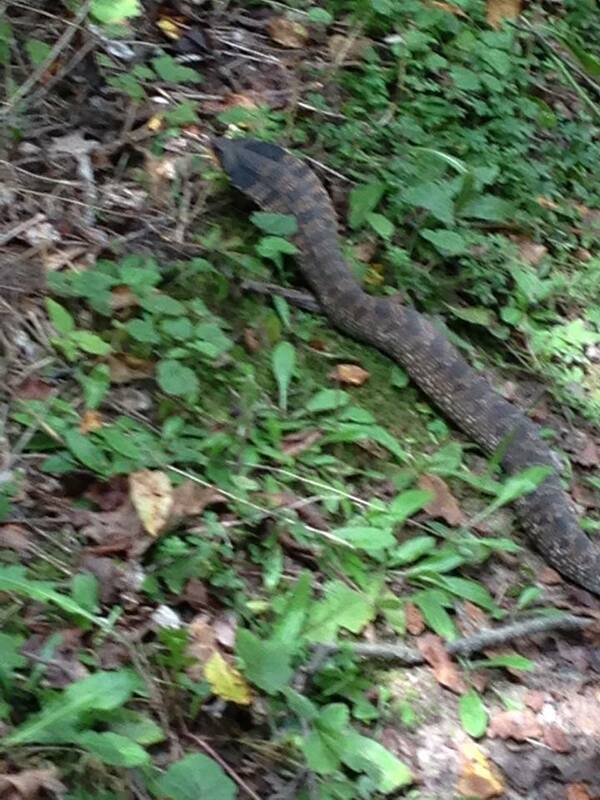 The snake was at least three feet long, big enough to cover the entire trail. He picked a bad place to nap, my bike going too fast to stop and my only choice was to roll right over the surprised serpent. Jon and Frank were about fifty yards behind me, just enough to stop before they got to the snake after I yelled “SNAKE!!!”. I turned around and came back to find two spooked friends trying to coax the hissing hog nose off the trail. The snake had spread out the upper portion of its body like a cobra, hissing and refusing to budge. Slowly it crawled away, hissing angrily into the brush next to the trail. Six hours total on the bike. Almost 4000 calories expended. 8:30 AM arrival, 5 PM departure. One..fantastic…day! Freshly moved in and genuinely happy redhead. I’m at real peace and afraid at the same time. The last few weeks have required some adjustment. It is more quiet around my house, a lot more time to relax and do my own thing. I miss her so much. So very much. Yet I am also happy, proud, excited to see my little girl toddle out on her own. It just seems like yesterday when she was a tiny little springy haired redhead who curled up under my arm next to me on the couch while I read her favorite books to her. 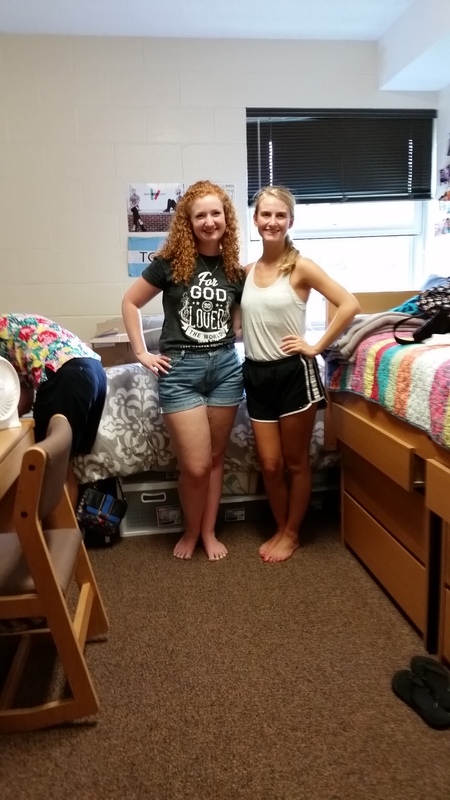 Three weeks ago, on a Friday morning, I woke up at 2:45, showered, then finished getting the family van ready for a trip to northeastern Indiana.. move in and welcome day for freshmen at Taylor University. Miriam and Alyssa had finished packing what was left to pack while I attempted to sleep the night before. ‘Attempted’ is the key word there because I did not sleep much. There was very little left to put in the van except for the cool bicycle I had rehabbed for Alyssa, a balloon tired cruiser bike with white walls, wrap around handlebars, fat seat, and wicker handlebar basket. My mom gave the bike to Alyssa and it was in bad shape when we got it. 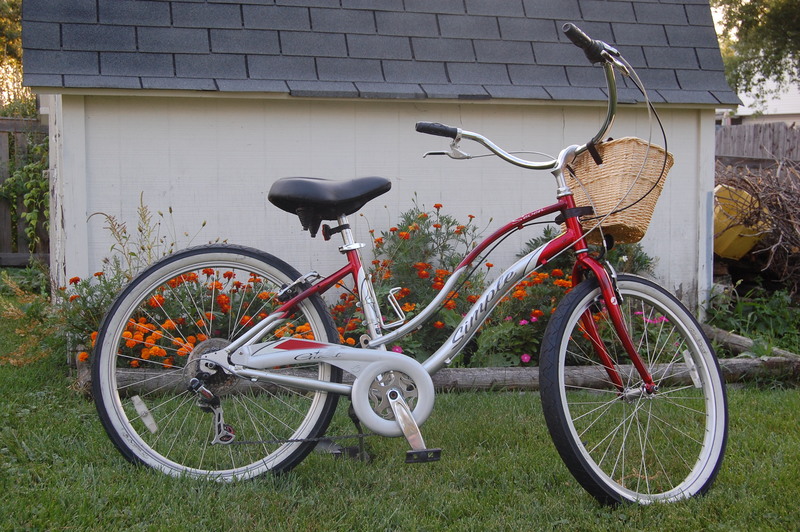 This was my mom’s bike and it took quite a bit of TLC to restore it. Alyssa really wanted this bike for college! We set off at 4:15 AM, turning back twice as first Mir forgot a set of bed sheets, then Alyssa forgot her sleep mask. Dad had two opportunities to exercise patience and I think I succeeded nicely. Both Alyssa and Mir sank into a deep sleep as I drove through a deluge that enveloped the Chicago area, my hands tight on the wheel with fright as the sideways rain coupled with darkness made visibility practically nil. I am not sure I have ever been so glad to see dawn’s light. As we navigated the highway south of Chicago, the rain stopped and the clouds rolled away. Driving south on I-65 towards Lafayette, Indiana I groaned as dark clouds loomed on the horizon. Torrential rain soon greeted us, the roads partially flooded as our van turned east from Lafayette. At times we hit water so deep that I am surprised we made it across. We did. We made it to the university with plenty of time to spare. My daughter didn’t sound unhappy, but I think that maybe she wanted a little more time as our little girl. When our van crossed into the dorm parking lot, our little girl was going to graduate to our young woman. She has been ready to become that young woman for a while. That storm brought hot, steamy temperatures with it. I counted my lucky stars as two student leaders from Alyssa’s dorm wing greeted us and led us to her first floor dorm room. Sweat soaked fathers shuffled up the stairs past us as they moved their daughters into their second and third floor rooms. Leslie, Alyssa’s room mate, had arrived earlier in the day but was away when we got to the room. I left Alyssa and Miriam in the room to begin bringing things in from the van while they began to plan how the beds and furniture would be arranged in the room. The beds, dressers, shelving, and desks were all stackable. A large armoire for each girl could be moved any where in the room. Moving Alyssa’s things in would only be half of the task. Leslie’s dad and I were going to have some work to do moving that furniture around. Leslie and her parents arrived shortly after we got to the room, a couple around our age. Their daughter is their youngest of three children, all attending Taylor. Her parents had already found out a few things about Miriam and I, asked me if it was right that I had graduated from Ozark Christian College. They were excited to find out that I had indeed graduated from Ozark. All four pastors on staff at their church were Ozark graduates and I had attended school at the same time with two of the pastors. It was cool to talk to them. And not so cool to sweat with them. Did I mention that the dorm is not air conditioned? The room came together nicely, our two girls working together nicely to decide on the best arrangement. Alyssa had planned well for her move, much of her things ready in plastic bins that we stored underneath her bed. She had purchased a set of bed risers that have built in USB connectors and electric outlets, the risers adding another twelve inches to the height of Alyssa’s bed. Leslie’s dad shared a lot as we worked together on the room and as we watched the ladies decorate. He told me something that made leaving my daughter so much easier, changing my perspective in such a good way. He was right and I knew it. The lump in my throat left as I heard that. I also realized that I was ready for my girl to leave the nest. It has nothing to do with wanting her out. She is a gift to me, my daughter, the girl who wants to please her father, the reason for so many smiles the last eighteen years. No, I knew I was going to miss her. That is a given. The reason I was and am ready for her to leave is that I know she is ready. This girl is going to succeed and I can not wait to see that happen. Alyssa and Miriam fretted over the room as I sat out in the hall, a spectator. They hung twinkling lights from the ceiling over her bed and attached to the wall, pictures pinned to the wires. The duvet on her bed matched her room mate’s, their planning prior to move paying off. Before I knew it, the room was ready and we had met many of the girls our Alyssa would be living amongst. We went to our hotel. Showered and changed. Took Alyssa to get her student ID and picture. Had dinner off campus, then returned for a chapel dedication ceremony. Alyssa went to the ceremony with her new friends, promised to meet us there, but she was late and did not sit with us. I could tell Mir was disappointed. I was too but, well, kind of happy at the same time. She was not having a hard time at all. After the dedication service, parents went to a dessert reception while the students went to mandatory dorm meetings. Then we went back to the hotel without our daughter. Strange. It felt very, very strange to be alone together without our daughter. Oh yeah, I forgot to mention that we had left Nate at home because he had a golf meet on Saturday. He called Miriam while we were at that dessert reception. Crisis. He had accidentally put a divot in the golf green at practice that day.. and was suspended from the golf tournament the next day. So although it felt strange to be alone without our daughter, I had the familiar ring of crisis while I listened to my wife try to deal with Nate’s crisis from our hotel room. I felt bad, I really did. I was also really tired. I think Miriam forgave me for falling asleep. The next day was short. We were expected to leave after lunch. The school had activities and games planned for the new students at 1 PM. We met Alyssa at her dorm after breakfast, where I helped her friend Kate set up a wireless printer. We took Alyssa to the campus employment office to fill out paperwork, then spent some time with her before lunch in the school’s dining commons. Lunch. Our final meal with her. Alyssa excitedly told us about us about the mandatory dorm meeting the night before. Her dorm wing had met their brother dorm wing and took what was called an ‘Awk Walk” with them across town to get a soft drink together. The town Taylor University is in, Upland, is very small. During the walk, each girl had to walk hand in hand with a guy while they each answered a question. When the question was answered, they switched partners until they had to chance to meet each boy. Yes, my daughter liked that. I might be afraid of what might be coming next. Our daughter could not wait for lunch to be over. She stood up, hugged each of us, turned and left for the planned activities. That was it. No tearful goodbye. Mir was disappointed. That was not what she expected. Somehow I was not surprised. I could not hide my smile. We drove back to Chicagoland that afternoon through more rain, a storm so bad that we didn’t have opportunity to cry. Mir went right to work on Alyssa’s room when I got home, the tears rolling as she straightened up the empty room. That was tough for me too, seeing that empty room. It will never be the same. I go to her room a lot now. Sit on her bed. Look at the posters on the wall. The window curtains are open all the time now, sun and moon shining in, remind me of the space that is there. Yeah, I miss my daughter but I am glad she is gone, at such a good place. I am comforted and I like the space in her room. She is still there. Always will be. Sunday morning was the next morning after we returned. Our morning, the time special, when Alyssa goes with me to Panera for breakfast before church. I had to go there. Our favorite girl, Kaitlyn, asked about Alyssa when she took my order. I took a selfie with Kaitlyn and tagged Alyssa when I posted on Facebook. Alyssa was waiting for that tag and I smiled as she commented right away. She was there with me. Always will be. Sundays are when I miss her the most. Sundays always began with my daughter and ended with my daughter. Every Sunday night ended when I picked her up at the mall from work, stopped for a drink at McDonalds on the way home, talked about our day. Sunday was my day with Alyssa, the day of my daughter. Smart phones have changed things. We keep in touch. She sends me pictures. I don’t have to wait for a letter. But I couldn’t wait until I got my paycheck — I took the afternoon off, wrote a letter to Alyssa, and sent the letter off with a few twenties in it. Mir is doing surprisingly well. Thank god for cell phones. We are doing well. Thank god for cell phones.